I’d been looking for a new travel bag that could fit my iPad, DSLR camera, passport, wallet, mobile phone and other stuff for my South Korea trip this March. 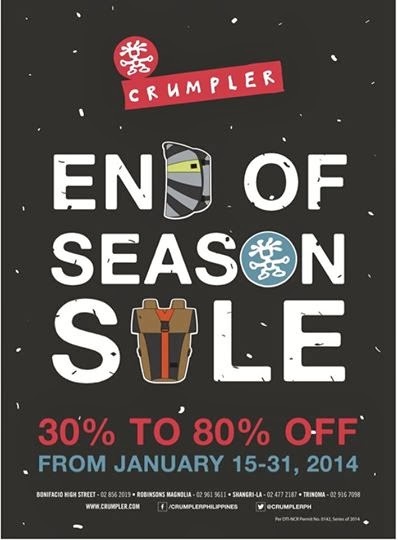 Luckily, Crumpler Philippines is having their end of season sale until January 31, 2014. Imagine, you can get your favourite Crumpler bags at 30% to 80% discount, WOW, big savings. The Crumpler sale is happening in their Trinoma, Shangri-la Plaza, Robinsons Magnolia and Bonifacio High Street branches. Last week, I visited their Trinoma branch to see the items on sale, the Million Dollar series I am eyeing since then is at 60% less but because I am not looking for a camera bag only, I chance upon the Sebang Outpost at 30% discount. Original price of the large version is at Php4600 but I got it for Php3200 only. Sebang Outpost is part of The Outpost Project released last year for people who know how to live. The bags are style proof for adventurers, photographers, riders, designers, makers, thinkers and doers. The bag also comes with rain cover for protection during heavy downpour. I’ve got midnight blue, other colors are orange brick and rifle green.